Silverton, a laid-back town, 15 miles to the east of Salem, is the home of Oregon Garden with more than 20 themed areas and the site of Frank Lloyd Wright’s Gordon House. 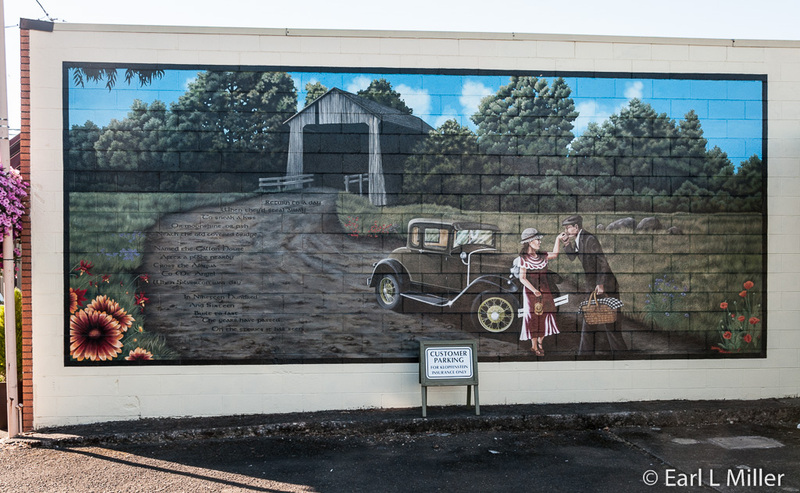 Community pride is shown in 24 murals, throughout the town, about its citizens, landmarks, and values. The historic Gallon Covered Bridge is nearby. Next to Clark Gable, who worked at a Silverton mill before he was found, and cartoonist Homer Davenport, Silverton’s most famous citizen is of the four-legged variety - Bobbie, the Wonder Dog. His story dates back to 1923 when this Scotch Collie/English Shepard mix lived with Frank and Leona Brazier, owners of the Reo Café. On a cross country trip to Indiana that year, Bobbie’s parents packed up their Overland Red Bird Touring Car taking Bobbie with them. He rode on the running board or on top of their luggage in the back seat. When they reached Wolcott, Indiana on August 15, Frank Brazier was gassing up their car when a pack of three local mongrels jumped Bobbie. The dog gave out a yelp and ran for his life. Thinking that the dog would take care of himself, Brazier returned to the car, expecting to find Bobbie at the house where they were staying. After an hour or so, when Bobbie had not appeared, and knowing the dog would come running when he heard the Overland’s horn, Frank drove around Wolcott honking it at frequent intervals. At midnight, he gave up. The next day, he called everyone in Wolcott, without results. Heartbroken, the Braziers headed back to Silverton, afraid they would never see Bobbie again. Frank left messages that if the dog was found to crate him and return him by rail to Silverton. Exactly six months later, on February 15, 1924, the Brazier’s youngest daughter, Nova, and her girlfriend were walking down a street in Silverton. Nova gasped and turned to her friend, saying, “Oh look! Isn’t that Bobby?” At those words, a shaggy, bedraggled, very thin dog, just beyond them, turned his head and in the next moment flew at Nova. He leapt up repeatedly covering her face with kisses and making half-strangling sobbing sounds of relief. Yes, it was Bobbie. What a happy procession it was that hurried to the restaurant where the dog hunted out his owners, told them how happy he was to see them, and had a meal of sirloin steak and cream. Mill workers packed the café that day, and before long, the story was all over town of Bobbie’s return. Within weeks, every major newspaper and magazine in the country ran the account of Bobbie’s trek. Through letters and interviews, an investigation was able to establish the general route Bobbie had taken home. Bobbie had logged close to 2,800 miles, across more than seven states, as he traversed the Rocky Mountains, traveled through the Snake River plain crossing several rivers, and made it into Oregon during winter time. Bobbie was spotted several times in the Midwest and stayed with a family in Des Moines for several weeks. He left Iowa the day after Thanksgiving and was next seen by a family in Denver then by one in Dalles, Oregon. A woman in Portland nursed back to health his bleeding, raw feet. The last leg of the journey was down the Willamette Valley from Portland to Silverton. The Oregon Humane Society gave him a silver medal and a jeweled harness. He made a number of personal appearances and was gifted with his own dog-sized bungalow called “Bobbie’s Castle.” His fame inspired Ripley to create a cartoon about him, and he starred in his own silent film “The Call of the West.” Disney’s “Incredible Journey” movie was about this trip except it added another dog and a cat to the cast. He died in April of 1927 at the age of six. His veterinarian determined that Bobbie had aged 10 years due to the rigors of his long journey. 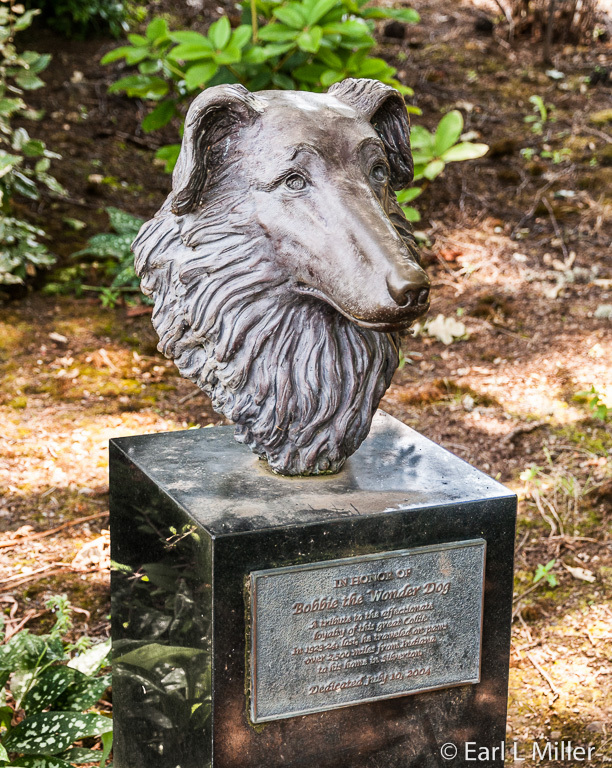 He is buried at the Oregon Humane Society in Portland. His funeral was attended by more than 200 people including the mayor. A week later, Rin Tin Tin came to Portland to lay a wreath on Bobbie’s grave. In 1925, Bobbie fathered his son, Pal, who remained a family pet and companion to his father. Pal, after Bobbie died, led the annual Silverton Pet Parade for many years. The parade, which started in 1932, honored Bobbie and has served as a reminder of how important pets are. Held the third Saturday in May, it is the oldest continuous parade of its kind in the United States. 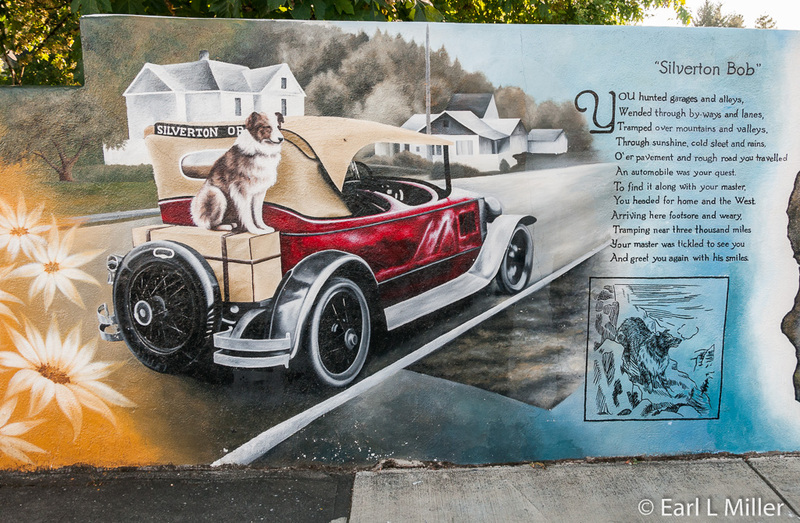 Since 1932, the Silverton Mural Society, a nonprofit organization, has raised funds for murals telling tales about the town. A great place to pick up the brochure and map of the murals is at the Silverton Chamber of Commerce and Visitor Center at 426 S. Water Street. Their telephone number is (503) 873-5615. Most murals are located downtown within easy walking distance of each other. A few, such as the Silver Falls Timber Company and The Oregon Trail must be reached by car. All were made with oil-based paints, each coated with an ultraviolet protectant to shield it from the weather. Seven different muralists painted them with David McDonald responsible for nine and Lori Lee Webb for five of them. 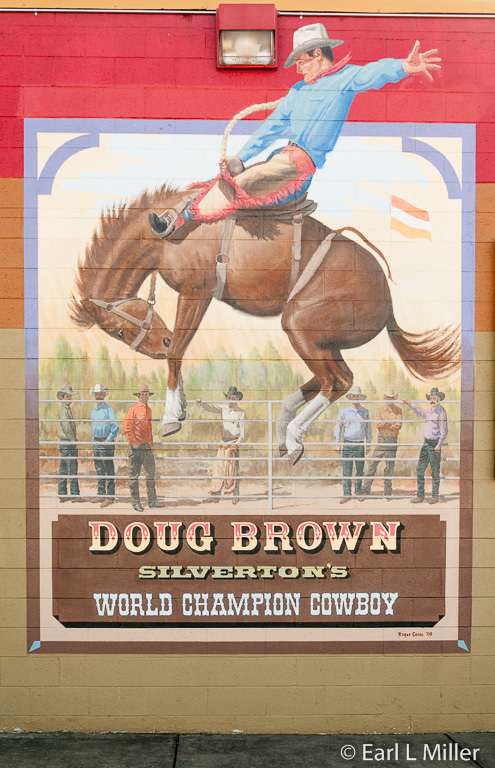 They depict people who are important to Silverton. These include Henry Davenport, an early 1900's political cartoonist; Don Petit, who served for a six months as a mission specialist aboard the International Space Station; and Doug Brown, World Champion Bull Rider in 1969. 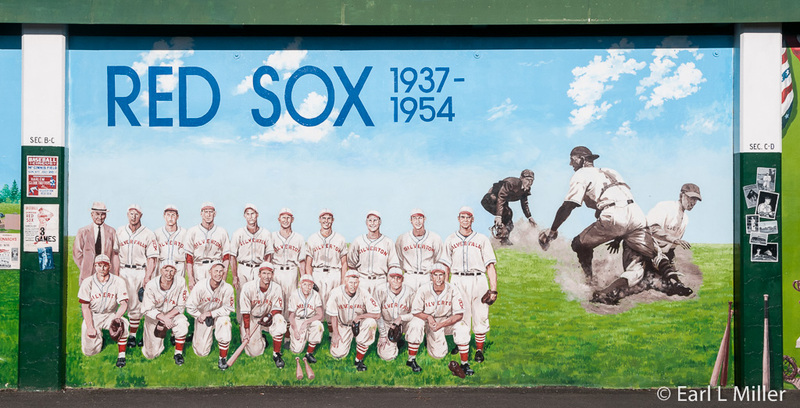 The Silverton Red Sox is a three-panel mural about the farm team for the Boston Red Sox that played between 1937 and 1954. 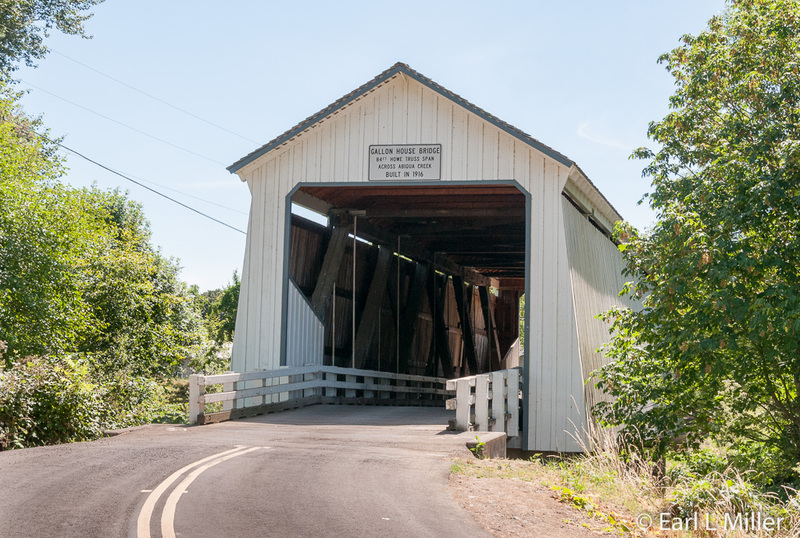 Some are on local landmarks such as Gallon House Covered Bridge, the Silverton Airport, and nearby Silver Falls State Park. Veterans, the Four Freedoms, as espoused by Norman Rockwell, and Paws for Love, Silver Falls Library’s therapy dog program, that encourages reading and a love of learning are celebrated. Be sure to check out the wall of murals by Lori Lee Webb depicting Bobbie’s story located on South Water Street near the footbridge crossing Silver Creek to Town Square Park. The Silverton Pet Parade Mural is at 600 First Street. It was painted by David McDonald, the first of the town’s mural painters. It shows children, adults, and pets strolling through downtown as spectators cheer them on. This is the last original covered bridge remaining in Marion County, Oregon. Built in 1916, it spans Abiqua Creek located about 1-1/2 miles northeast of Silverton. It received its name when the bridge served as a “pigeon drop” for liquor at its north entrance. Operators at a liquor dispensary sold “white lightening” whiskey by the gallon to Silverton residents. Silverton was dry at the time which meant no liquor was allowed to be sold in town. The bridge was in Mt. Angel territory which was wet. The bridge has been repaired a number of times since 1916. The last was in 1990, when because of poor structural condition, it was rehabilitated to mint condition. To get there: At Silverton, travel north on Highway 214 to Hobart Road. Turn west on Hobart to Gallon House Road, about a half mile. Turn north on Gallon House Road. 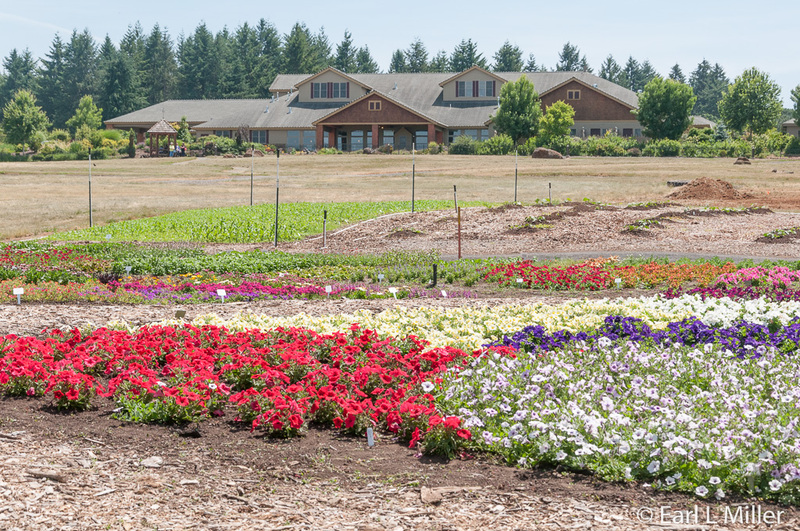 Since 2001, when it held its grand opening, Oregon Garden’s mission has been to provide visitors with an understanding of Pacific Northwest ecology as well as a meaningful educational experience for gardeners of all skill levels and ages. Today’s guests can tour 80 acres consisting of more than 20 specialty gardens. The variety of gardens satisfies a lot of interests. These range from Children’s, Pet Friendly, and Silverton Market Gardens to Sensory and Medicinal Gardens. 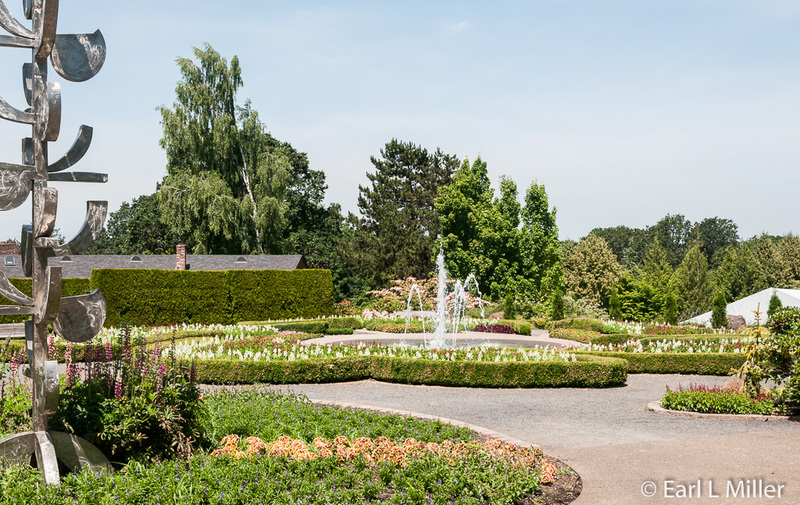 The Amazing Water Garden, Conifer Garden, Northwest Garden, and Lewis and Clark Garden are all waiting to be explored. All are small and adjoin others. Make your first stop the Visitor Center to pay admission and pick up a map of the gardens. It’s possible to walk Oregon Garden’s entire trail. However, the hike is 5-1/2 miles, and the terrain is hilly. The tram ride is included with your admission with on and off privileges as many times as you want. Running from April to October, it lasts approximately 25 minutes and is narrated. I suggest taking the entire route first as it provides a general overall of this attraction. It will also give you an idea of where each of the gardens is. That way you’ll know which of the six tram stops you should get off at for a closer look. Let’s take a look at some of the gardens. The Wetlands has played an important part in Oregon Garden’s history. In the 1940's, the Oregon Association of Nurseries explored developing a botanical garden to showcase the plants they grew. In the early 1990's, Silverton was having problems with the EPA who considered their treated wastewater too warm. It was killing the fish, and Silverton was about to be fined. The two groups formed an agreement in 1995 to use the city’s waste water to create a wetlands environment for a variety of plants and animals. The water runs at a rate of 300 gallons a minute in peak season through a series of terraced pods, with cascading water pools and wetland plants, into a holding tank. Then it flows into a system which irrigates the garden. The system cools the water three to five degrees. 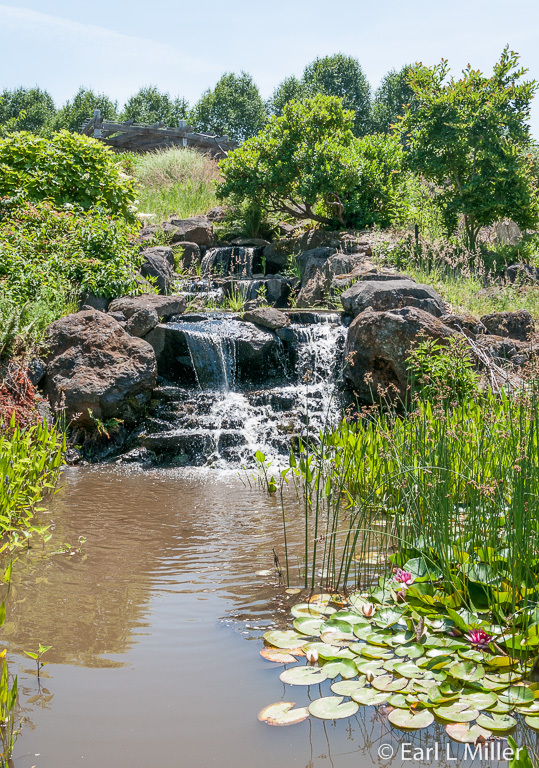 The Amazing Water Garden is a short walk from the Visitors Center. It incorporates a circular water garden with an ornate bridge, paths that criss-cross, and a cascading waterfall. 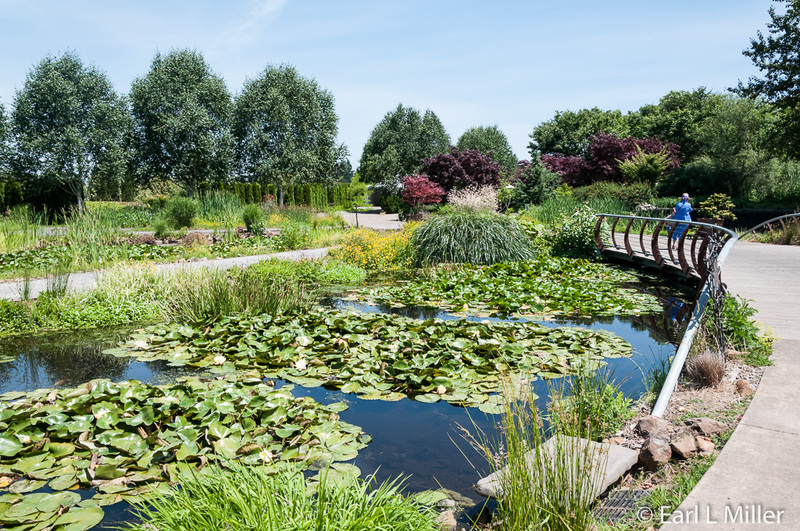 In 2002, the Amazing Water Garden received an award in the area of Environmental/Sustainable Design from the Oregon Chapter of the American Society of Landscape Architects. 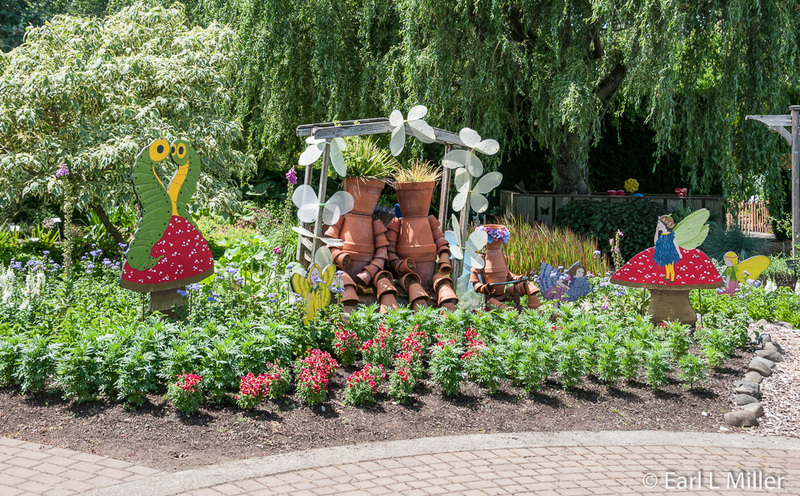 The Children’s Garden features topiaries, a Hobbit House to climb in and over, and dinosaur bones in a “Dinosaur Dig.” Next to it is a Train Garden attracting youngsters of all ages. The train is roughly 1/20th the size (G-scale) of an early 1970's Southern Pacific train that once ran through Silverton. It runs on a 120-foot circular track, complete with tunnels and trestles, surrounded by dwarf conifers and other small plants that fit the train’s size. It normally runs between 10:00 a.m. and 3:00 p.m. daily. Next to it is the Silverton Market Garden growing agricultural products found in the Willamette Valley. Many of the 147 Oregon crops ranging from berries to other fruits, grass seed, hops, hazelnuts, and various vegetables are represented. Produce from this garden is used in the visitor center café and donated to needy families. The Pet Friendly Garden is about how plants and pets can coexist in the garden. It has eight signs throughout that give hints on designing gardens that promote this. 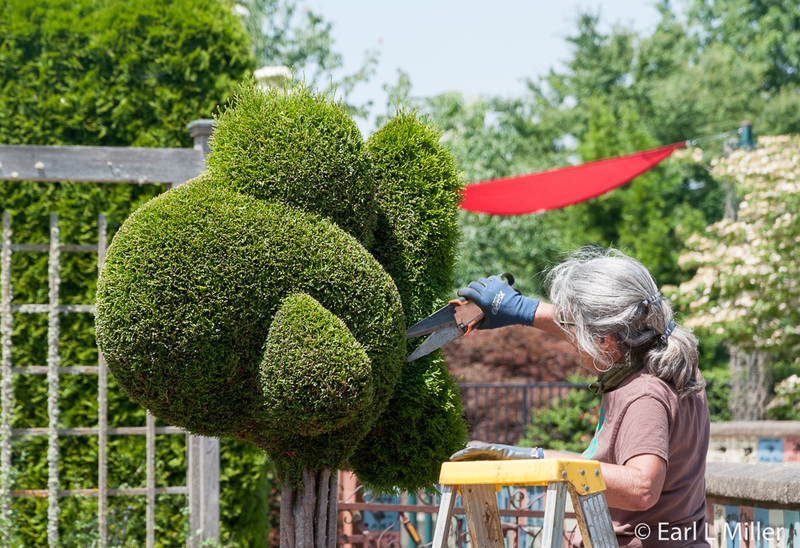 For example, some ideas are creating space for pets to roam, putting in a flagstone path where they make their own trails, and planting fruit your pet can enjoy. Protecting prized plants can be done by putting decorative pickets around them. In this garden, you’ll also find a statue of Bobbie the Wonder Dog. Close to it, the Rose Garden has nearly 40 rose varieties. Its beds are laid out by color from yellow to pink and deep red. You can relax on benches here as you appreciate the blooms. Opposite is the Green where Oregon Garden holds weddings and such special events as their June Brewfest and summer movies. The nearby Tropical House features plants seen in warmer climates. These include hibiscus, oleander, orchids, and bananas. They’re kept in a greenhouse where the environment is kept warm and humid. The Sensory Garden highlights scents and textures. It even includes a peanut butter tree. The Medicinal Garden displays many different types of plants that have homeopathic medical properties when they are properly prepared. A Northwest Garden features plants and trees found in the Pacific Northwest. The Lewis and Clark Garden displays the many botanical finds Lewis and Clark documented on their Corp of Discovery journey. It has interpretative signs and plant labels. The Axis Garden is next to the Conifer Garden. 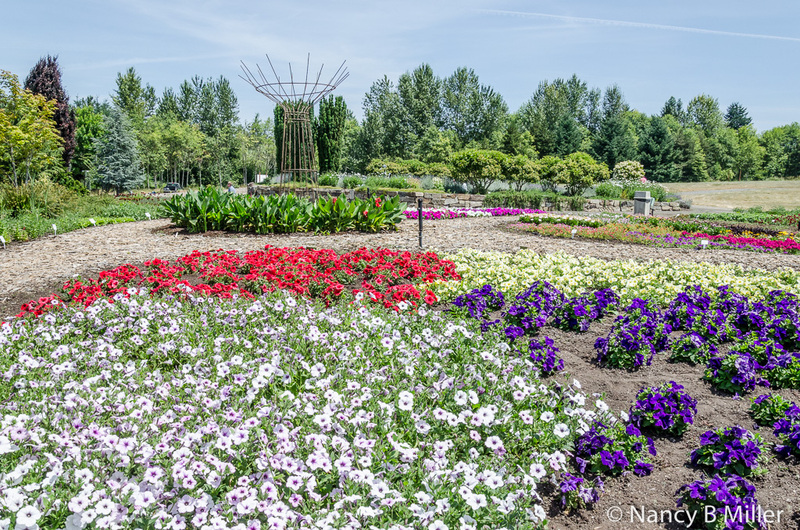 It’s a pattern of turf and ornamental plantings featuring seasonal color displays. It leads to the Oregon Garden Resort. Oregon Garden also believes in committing to sustainability. It has a 25-acre native oak grove with many trees more than 100 years old. One is a 100-foot high Signature Oak that’s more than 400 years old. It’s one of Oregon’s heritage trees. With 700 species, the Conifer Garden is one of the largest collections of dwarf and miniature conifers in the United States. Its trees come from around the world. The American Conifer Society Western Region is currently working with Oregon Garden to almost double the size of the Garden. It’s the oldest garden at this attraction and a reference guide for the American Conifer Society. The Rediscovery Forest is a demonstration 15-acre Douglas fir forest managed in partnership with the Oregon Forest Resources Institute. Interpretative signs along the trail explain about reforestation, growing the Garden’s eight different types of Christmas trees, and hardwood forest management. On your tram ride, you’ll learn the differences between managed and unmanaged forests. You’ll also discover that Oregon is first in growing Christmas trees. The Oregon Garden Resort is on the grounds. All of the rooms have a fireplace, private patio or deck, refrigerator, and microwave. The Garden View Restaurant and a lounge with live nightly entertainment are found at the lodge. Oregon Garden admission is included in the room rate. Oregon Garden is open daily. Its hours are May through September 9:00 a.m. to 6:00 p.m. It’s open 10:00 a.m. to 4:00 p.m. the rest of the year. Admission is $11 for adults, $9 for seniors ages 60 and over, $8 for students ages 12-17, $5 for children ages 5-11, and free for those under age five. Adjacent to Oregon Garden, visitors find the Gordon House. 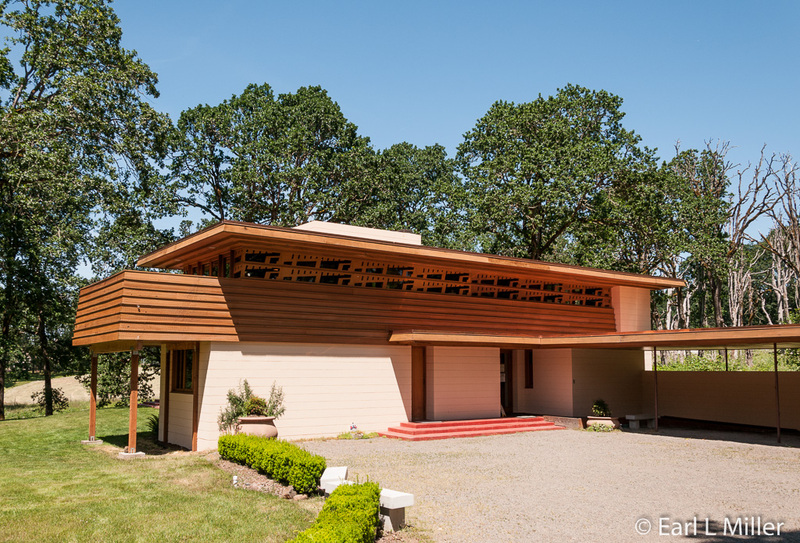 It’s the only Frank Lloyd Wright house in Oregon and the only one in the Pacific Northwest open to the public. Guided tours, which must be reserved, occur at noon, 1:00 p.m., and 2:00 p.m. You’ll learn about the home’s history and come away with an understanding of the theories behind Wright’s architecture. In 1956, Conrad and Evelyn Gordon commissioned Wright to design a home for their farm on the Willamette River in Wilsonville, Oregon. Wright was 89 when he took on the commission and died before the home was finished. It was completed in 1964 under the guidance of Talliesin Associated Architects, Wright’s architectural firm. Burton Goodrich, one of Wright’s apprentices, supervised the construction. The Gordons remained in the home for the rest of their lives. Their heirs sold it to new owners in 2000 who did not want the house. They donated it to the Frank Lloyd Wright Building Conservancy, a charitable organization whose goal is to maintain the Wright legacy. In exchange, the conservancy had three months to move the home from the site or the house would be torn down. It is now run by the Gordon House Conservancy. The house was deconstructed early in 2001 and moved to land owned by Silverton. Before being moved in sections, all building components, including the built-in furniture, were removed, labeled, and packaged so the house could be accurately restored. The home’s second story was moved as one unit. It was like a giant jigsaw puzzle. Upon its arrival in Silverton, the house was sited magnetic north to meet Wright’s original architectural plans. The same radiant heat system was restored, and the signature Cherokee red, concrete floor was precisely reconstructed. The house opened to the public in 2002. It is on the National Register of Historic Places. 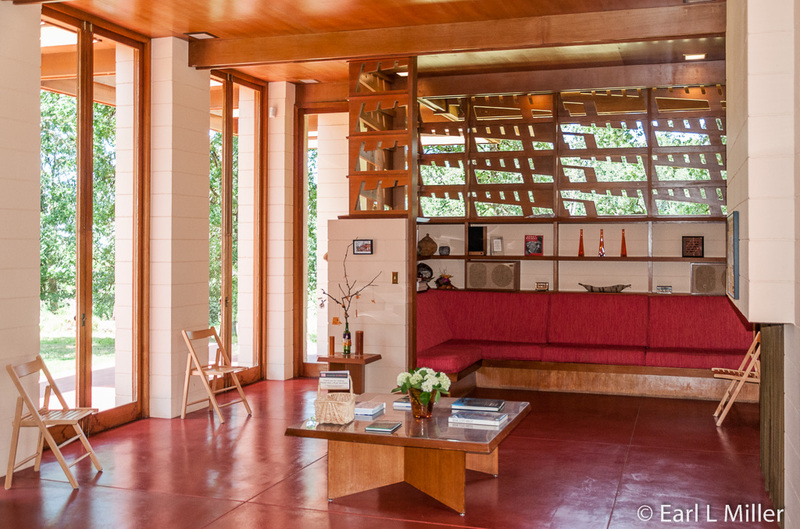 The house is one version of Wright’s Usonian design which he started in the 1930's. Wright coined that term to refer to his concept of a small, affordable house reflecting the local environment, meeting the needs of homeowners, and using modern construction techniques. No two homes were alike. Yet all had common elements including slab-on-grade construction, concrete floors, hydronic radiant floor heat, the open floor plan, and carports. Wright did not believe in garages as he felt they were only a place to store junk. Throughout your tour, you’ll have Wright’s design principles pointed out to you in this 2,133 square foot house. A leading one was to bring the outdoors inside. One way was by using floor-to-ceiling windows. Another was to have soaring cantilever balconies for the two upstairs bedrooms. Wright’s use of horizontal lines can be seen in the flattened roof line with deep eaves, carport wall, masonry block joints, and board and batten walls. Wright worked to eliminate corners as he felt they gave rooms an inhumane boxlike appearances. He further believed in open floor plans. In the Gordon House, the living area, dining area, and library are all part of a larger, main living room space. Local, simple building materials, such as concrete blocks and Western red cedar wood, were left in their natural color and texture to age gracefully through the years. Natural and organic were two guidelines constantly involved in Wright designs. Wright called the kitchen the Work Space. It didn’t have windows as he felt those sacrificed storage and the bubble skylight provides plenty of light. The Gordon kitchen has a Jenn Aire electric stove and double oven, Revco Gourmet refrigerator with a freezer in the bottom, an electric range, and a Kitchen Aid dishwasher. Only the dishwasher has been replaced. The Gordon features the first Moen single lever faucets and the first Kohler uni-body toilets. He believed using very high ceilings and skylights gave a sense of openness and light to a compact space. He enjoyed employing fretwork, perforated boards over windows. These also define the smaller spaces such as the library and dining alcoves. 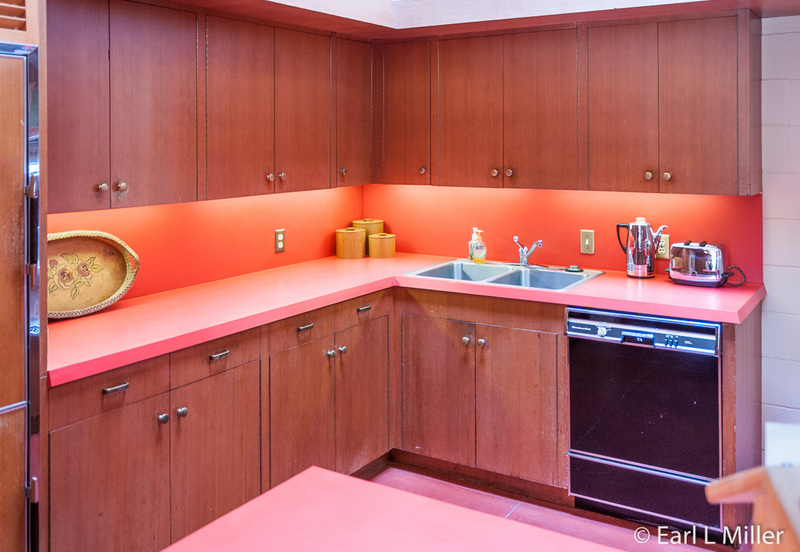 They filter light, much like stained glass windows, and are unique to each of the Usonian homes. 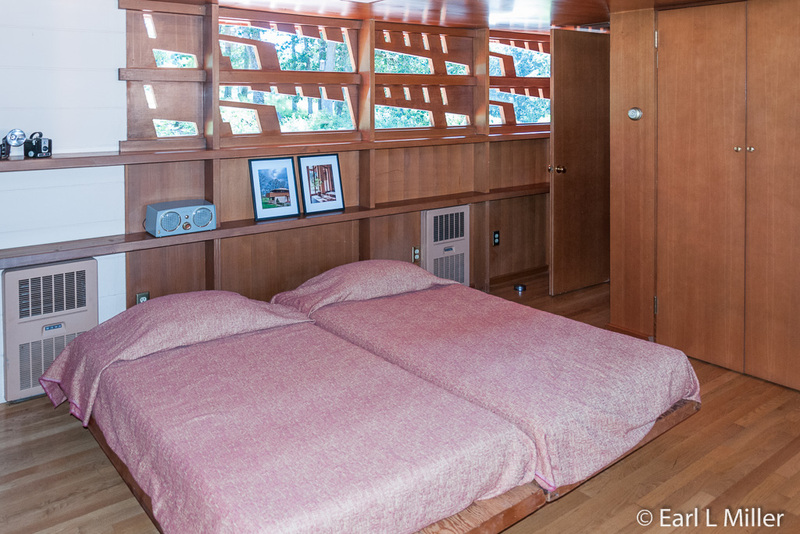 Frank Lloyd Wright preferred built-in furniture to enhance spaciousness rather than using independent furniture. The benches, tables, and beds are all on display at the Gordon House showing his preference for built-in and modular furniture and storage for an uncluttered appearance. The Gordon House is located at 869 W. Main Street in Silverton. Admission is $15 with a $5 discount if you stay overnight in Silverton or show your AAA card. Children with adults are free. For reservations or more information, call (503) 874-6006. Their web site is www.theGordonHouse.org.